Below is a press release from the William K. Busch Brewing Company, followed by additional information gathered by the Boone Country Connection. DEFIANCE, Mo. – William K. Busch Brewing Co. is expanding their horizons locally after applying for approval of a Conditional Use Permit at 4151 Benne Road to build a farm brewery and distillery on Blue Heron Farm. The site is located near Busch Wildlife on the old Bridlespur Hunt Club property. 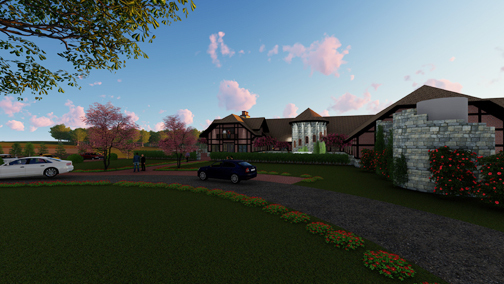 Construction is slated to begin later this year. The planned micro-brewery is approximately 20,000 square feet, will seat approximately 265 patrons and will produce a maximum of 2,500 barrels annually. The allotted space is located toward the start of the wine trail in the Highway 94 corridor and will allow the company to focus on creating artisan-style beers, which will include hops and barley grown on the property. The focus of the farm brewery will be on small batches of high quality lagers as well as other unique beer styles. Some of the offerings will only be available at that location, while others will be canned or kegged and sent off to distributors. The distillery plans to craft a line of handmade whiskeys and beers, including whiskey barrel aged beers and beer barrel aged whiskeys for customers to explore. “The symbiotic nature of the two crafts under one roof will be exciting to watch unfold,” said Gottfried. 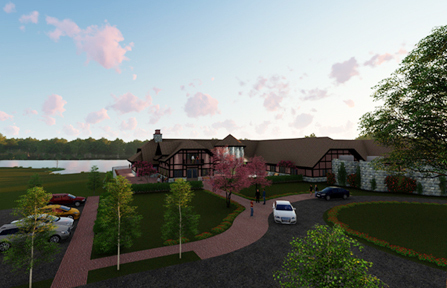 Artist's rendering of the proposed Brewhouse - view 1 front. 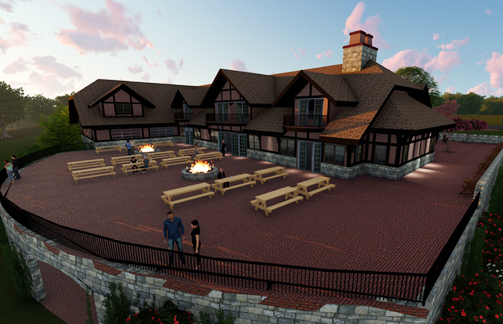 Artist's rendering of the proposed Brewhouse - patio view. I met with Billy Busch and Marc Gottfried this week at the Bridlespur property to discuss their plans. They are aware that people in the area have concerns. Billy says he doesn't blame anyone for being concerned, and he welcomes the opportunity to talk to people and explain more about the project. "I don't intend to do anything to mess up this beautiful area. I just want to add to it." We talked about traffic concerns. Both Busch and Gottfried feel any increased traffic will be negligible. For the production facility, they anticipate very light traffic – about three trucks per week average, in and out. How does that compare to the quarry truck traffic? A spokesperson for the BMC Stone Quarry on Hwy. DD told the Boone Country Connection that the average number of loads per day leaving the quarry ranges from 50-150, depending on the weather/time of year. Currently, the W.K Busch Brewing Company produces about 8,000 barrels of beer annually. Most of that production will remain where it is currently being done (City Brewery in LaCrosse, WI.) "A small amount could move to the new Brewhouse (kegs only) but that decision is not final yet," said Gottfried. The Benne Road facility will be capable of 2,500 barrels total which will mainly be new craft beers, plus some Kraftig and Kraftig Light for people to enjoy at that location. The press release says the facility will have a 265 person seating capacity, however, the Conditional Use Application defines 250 indoor seating capacity plus 250 outdoor seating capacity. Gottfried said the facility could potentially accommodate a wedding up to 500 guests but for everyday business, they will not provide that many seats, nor do they expect crowds that large. Current plans call for a gravel parking lot that would accommodate 105 parking stalls and 4 accessible stalls. How does the seating capacity compare to other area venues? Chandler Hill Vineyards has a combined indoor and outdoor seating capacity of 250 guests; the pavilion at Defiance Ridge Vineyards seats 300 people; The Quarry Wine Garden in New Melle has combined indoor and outdoor seating for 350-400; and Montelle Winery in Augusta has outdoor seating for up to 600 plus a new indoor facility that seats 200. Busch and Gottfried expect traffic for the Brewhouse will be comparable to the local wineries: lighter during the week, busier on the weekends – with seasonal fluctuations and occasional special events. Gottfried said, "It is not something that is going to dump hundreds of cars on Hwy. DD or Benne Road on a daily basis." Busch emphasized that he wants to preserve the rural, pristine area, and make it better. He said, "We're outdoor people, conservationists, environmentalists, and our intention is to be able to continue that on a beautiful piece of property in a barn shaped brewery that fits into the area and fits into the community. It will have a family atmosphere with good food, good beer, and animals. It's what the Busch family has been about for many years." He continued, "The last thing I want is to see is this land developed." For comparison purposes, if he were to sell the acreage [184 acres per the CUP application on the north side of the road] to a developer for 3-acre homesites, that would be about 60 homes. If you figure 2 trips in and out per day per home, that would be 240 vehicles per day. Busch said, "We won't be anywhere near that. Even filled to our capacity of 265 people, with 2 people per car, that's 132 vehicles. And that would only be on weekends/special events." Route DD Between I-64 and Diehr Road is around 9K-10K vehicles per day. That drops off to 3K-4K vehicles per day between Diehr Road and Route D.
Route D between Route DD and Route Z in New Melle is around 5K vehicles per day. Route Z between Route N and Route D in New Melle is around 7K vehicles per day. We tried to get traffic counts for Benne Road from St. Charles County, but the last study was in 1987 at about 150 vehicles per day. There are two very tight turns on Benne Road west of the proposed site, and a difficult left turn from eastbound Hwy. D onto Benne Road. The line of site at the intersection of Benne Road and Route DD is less than optimal. Per county documents, the Director of the Planning and Zoning Department of St. Charles County has determined that a traffic impact study will not be required for the purposes of a conditional use permit consideration, but may be required at the time of the site plan submitted to see if improvements to Benne Road might be necessary. The staff recommendation also states "Because this proposed use would include the use of semi-tractor trailers on rural County roads, the County Highway Department and/or the Development Review Division Director may require a traffic or turning movement study and/or improvements to Benne Road." Conditional Use Permit Request: Two conditional use permits have been filed with St. Charles County. 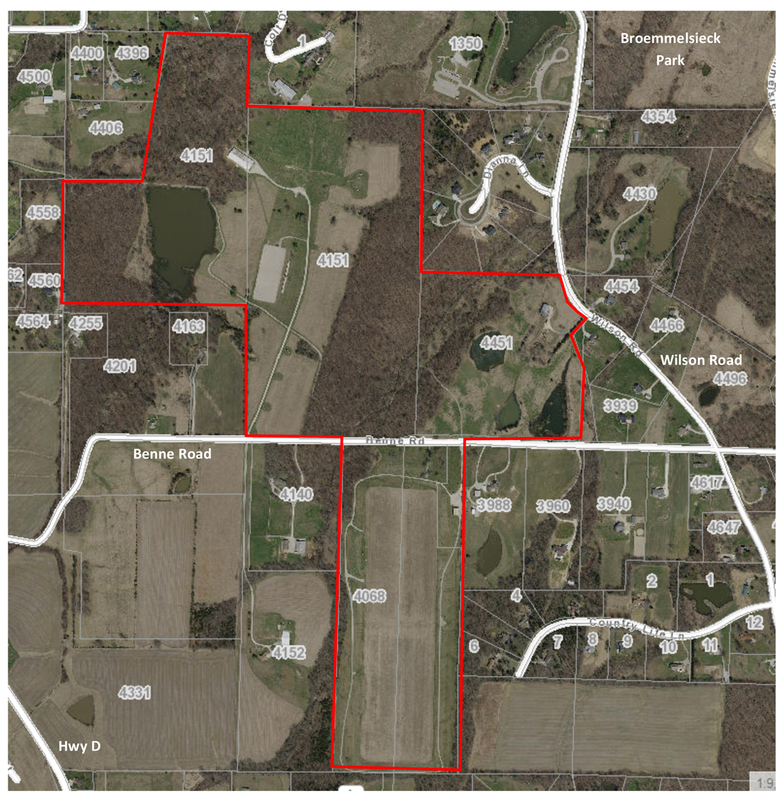 One is for the Brewhouse for 56 acres on the north side of Benne Road (a portion of the 150+ acre site) and one is for a 3 acre portion of a 62 acre site on the south side of Benne Road – where the Blue Herron Polo Field is located. (See the map below.) The conditional use for the south side is to accommodate temporary office space and a research pilot brewing facility in an existing building on that property. The lease on the company's current office space in Brentwood is expiring, and they want to move to the Polo field building until the new facility is complete. Once the construction of the new facility is complete, the office activities should be moved to the new Brewhouse. The company would like to keep the research facility in the building on the south side. The St. Charles County Planning and Zoning Commission will hold a public hearing on these requests on Wednesday, Sept. 19 at 7 p.m. in the Executive Building Council Chambers, Third Floor, (the Old Courthouse) 100 N. Third Street, St. Charles, MO 63301. Neighborhood Concerns: A group of nearby citizens has organized a meeting on this topic at Broemmelsiek Park on Sunday, Sept. 16 at 1 p.m. at Pavilion #7.